When will the red mist descend? If the black and silver options aren't doing it for you on the HTC One front, then you'll be pleased to hear that it looks like the Taiwanese firm will be pushing out a red version soon. 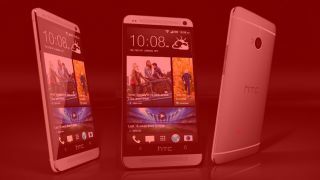 There have been some rumours floating around suggesting more colours were on the horizon for the new flagship handset, and this has now been taken to the next level with online retailer Handtec listing the red HTC One on its site - although it's now been taken down. The handset was priced at £419.99 SIM-free (around $653 / AU$640), but the web page stated the One was currently "out of stock", with no sign of a release date. Apart from the colour it seems to be business as usual on the red HTC One, sporting a 4.7-inch full HD display, 1.7GHz quad-core processor and fancy Ultrapixel camera. We were seriously impressed with the HTC One and it managed to become only the third smartphone to garner a five star review, propelling it to number one spot in our "20 best smartphones in the world today" - beating the likes of the Samsung Galaxy S4 and Sony Xperia Z. We contacted HTC regarding the red One, but the Taiwanese firm didn't have a comment on the speculation so we're just going to have to wait and see.